A movie "Winged Memories. 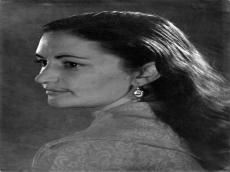 Leyla Vakilova" dedicated to a talented ballet dancer Leyla Vekilova will be shown in Baku. YARAT Contemporary Art Space invites you to the screening of a movie on June 20. Leyla Vakilova was born on January 29, 1927 and studied at the Baku State School of Choreography, a class of Tatyana Amirago, Adila Almaszade. She was also a student of the first Azerbaijan ballerina Gamar Almaszade. The dancer performed all classical and national repertoire at the Azerbaijan State Opera and Ballet Theater. She used to be an artistic director of the State Dance Ensemble and the Head of Baku Choreographic School. Unfortunately, Leyla Vakilova passed away on February 20, 1999. The film was directed by Babek Abaszadeh. The idea of ? ?the project belongs to the student of Leyla Vakilova -dancer, choreographer, Honored Artist of Azerbaijan, Doctor of Philosophy in Art Studies - Samir Samadov. The screening starts at 19:00. Free admission.